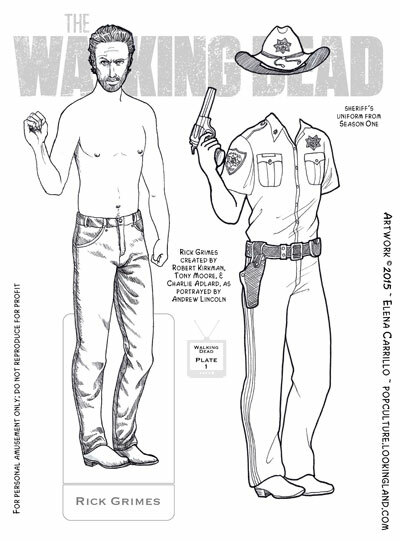 I almost feel like this one’s a cheat: Rick Grimes and his sheriff’s uniform. But it kind of had to be done, I guess. I also feel like I have to reiterate that I am making The Walking Dead dolls to amuse fan friends, which has been really interesting for me–typically I only ever make dolls for myself and so I feel passionate about the subjects. A very strong ambivalence can be passion, I suppose. Let’s just say the challenge has been good, but definitely a challenge. At any rate, I hope the results please you. One of the nice things about these being black and white is that you get to dirty Rick up to your heart’s content: go ahead: splatter some blood on him, make him good and filthy. Also, be sure to draw lots of bruises and band-aids on his face if you feel so inclined. I’ll tell you what, though: it took me about seven stabs to get that face to look anything like Andrew Lincoln. To be honest, I think it’s passable, but I really just gave in to “close enough for government work”. I can occasionally capture an actor’s likeness, but it’s definitely not one of my strong suits and something I am really working on. I don’t want to be a perfectionist too much about it, though, or else I’ll never get anything done. I struggled similarly with Daryl and Michonne. Everything is a learning process. I’m also aware that the pose is a little weird. I had in mind a reason for putting him like this (so that he could shoulder a rifle and hold a pistol), but I admit it looks funny. The crooked way he’s holding that pistol is intentional, however: the character can’t seem to hold his gun straight in the series ~ which is the subject of many very silly memes. Again, at some point I just had to stop fussing with it and cut bait if you know what I mean. 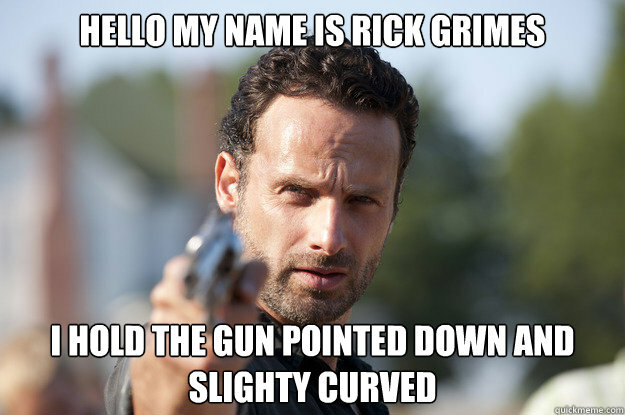 Rick, The Walking Dead. Bookmark.